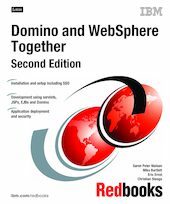 In this IBM Redbooks publication we explain how you can use the combined capabilities of Lotus Domino and IBM WebSphere to provide a complete and integrated platform for solutions like collaborative commerce. In the first part of the book we show you how to install and configure Lotus Domino R5.0.6a and IBM WebSphere 3.5.3. This includes setup of Single Sign On (SSO) between the different servers. We describe this for Windows 2000, but you should be able to use our description to guide you through setup on other platforms as well. In the second part of the book we look at how the WebSphere Java server components--servlets, JavaServer Pages (JSP) and Enterprise JavaBeans (EJB)--can work together with the functionality of Domino in a Web application, from a developer's view. We use one common sample application to illustrate how the different technologies can work together. In the last chapter we show how to deploy and secure our sample application. Among the topics we cover in appendices are advanced LDAP properties for WebSphere, securing the LDAP server and JSP custom Domino tags that support scripting. All examples are supplied as additional material for download from the IBM Redbooks Web site. These include general ways to handle application login and token expiry, forwarding to JSPs when using a Domino session, and so on.